Thank Heavens for time travel!! If it hadn’t been for that special ability of mine, I would never have met Conn Maguire, and that doesn’t bear thinking about! But happily I was able to travel in time, and I did. stared hard at it, blinked three times, opened my eyes and found myself with my back to a fence, facing a wooden house. I was clearly in front of someone’s home, but I hadn’t a clue whose home it was, nor where I was, nor in what year. There were sounds coming from one of the outbuildings behind the house so I headed in that direction. I reached the outbuilding and stepped out of the bright sunlight into the gloom of what was obviously the horses’ barn. The scent of manure and damp straw hit me hard, but I walked further in. I passed the harness and equipment hanging just inside the entrance, paused and looked around. Is anyone there, I called. There was a sudden movement on the far side of the barn and I turned towards it as a man stepped out of the shadows and into a column of light. He turned and faced me, naked to the waist. Wow! I inwardly exclaimed. Wow! I was looking at six foot plus of the most gorgeous man I’d ever seen, and he was coming towards me. His fair hair had been streaked by the sun, and his eyes were of the deepest blue. With his every step, muscles rippled beneath lightly-tanned skin that glowed with the damp of exertion. My knees felt weak. I smoothed down my hair and cleared my throat. Me: You’ll think I’m crazy, me being here in your home when I don’t know who you are. Can I ask your name? Him: It’s Connor Maguire, ma’am. But folks around here call me Conn.
Me: And can you tell me where I am, and what year this is? Conn: You’re in Wyoming Territory, 1887. We’re in the south of the Territory. This is the homestead staked out by my ma and pa, rest their souls. You’ll have seen the creek out there – that’s Liberty Creek. You’ll find the town of Liberty an hour’s wagon ride to the north of us. Me: You obviously don’t run a farm like this by yourself, or do you? Conn: No, ma’am. My foreman, Aaron, works by my side. And I hire hands when I‘ve need of them. Me: Just a foreman! You’ve no wife! That is, I mean to say, I expect your wife is a great help to you. I’m sorry – did I say something to upset you? Conn: You couldn’t know that Alice, my wife, passed on a year ago. Bridget and I are still grievin’ for her, and we always will be. My daughter. She’s about to start school. Me: How awful for her to lose her mother so young. Conn: I’m mighty grateful to you, ma’am, but your offer’s come too late. My need for help became pressing, and I took action. I’ve just been checking the harness for the wagon horses, and I’ll be leaving for Baggs in the morning to get me a wife. Me: I could be a dab hand at being a wife, too! Conn: I’m guessin’ you could, ma’am, but I’ve made a bargain to wed a woman called Ellen O’Sullivan. She’s arriving in Baggs late tomorrow. From what’s she’s said in her letter to me, I reckon she’ll do well as a wife. Me: But marrying someone you’ve never seen, isn’t that a bit risky? Conn: I think not. I’m not looking for what I had with Alice – I know I’ll never have that again. Ellen O’Sullivan sounds an honourable woman and from what she’s told me in her letter, she knows how to run a home and what to expect from a man. She’s of child-bearing age, and I want a son. So no, I reckon she’ll do fine. Me: But what about her appearance? You haven’t seen her. Doesn’t it matter what she looks like? Conn: Nope. I hope she’s pleasing to the eye, but like I said, I’m not lookin’ to repeat what I had with Alice. Now if you’ll excuse me, ma’am, there’s things I need to do before the morning. Me: Of course. Well, if things goes wrong … Ouch! Something’s blown into my eye. The Christmas Dinner is already becoming a distant memory. The tinsel is beginning to look a little sad around the edges, and the chocolates on the tree have all but vanished. The old year is passing, and a new year hovers in the days ahead, waiting to come in. Kate Johnson, Christina Courtenay, Jane Lovering at the Presentation of the RoNAs. … starting with Christina Courtenay: Although I seem to have been working flat out, 2012 was a brilliant year in many ways and the highlights for me were winning the Best Historical Romantic Novel of the year award (RoNA) with Highland Storms in March and then the Best Historical Read at the Festival of Romance in November with The Silent Touch of Shadows. In fact, Choc Lit had a fantastic year which is wonderful for all of us! Chris Stovell: In the year of the most spectacular Olympics, my two favourite gold medal moments were my eldest daughter’s wedding day in September and the publication of my second, novel Move Over Darling in October. Liz Harris: Looking back at the year, my professional highlight was launching The Road Back at Waterstones Oxford, in a room crowded with family and friends, and soon after that, seeing Evie Undercover come out on kindle. What a thrill! My personal highlight of 2012 was at the wedding of my older son, Luke, in October, when in his thank you speech, he turned to pay tribute to his brother, Jake, his best man. Luke choked up with emotion and couldn’t carry on speaking. They both will have a best friend for the rest of their lives. Margaret James: The awful summer weather made it easier to stay indoors and write lots of words, rather than sidle off down to the beach or lounge around in the back garden. The sun definitely shone on Choc Lit, though – what a fantastic haul of awards this year! Amanda James (aka Mandy): I will always remember 2012, for that was the year that I signed my contract with Choc Lit! I can still feel the incredible excitement, not to say shock when I received the email form Lyn. I have met so many lovely people in the Choc Lit team and feel very lucky. I can hardly wait for next April when I can hold my book for the first time. And a picture of my son, James, and my daughter, Sarah – my two finest ‘publications’ – looking so pleased for me. Sue Moorcroft: Looking back at the last year, a few things jump out at me. One is how much I’ve enjoyed the company of friends – writing friends, gym bunny friends, new friends and old. Kind of linked to that, I stepped out of my own genre to go to a couple of interesting conferences, Alt Fiction and the Historical Novel Society Conference, and thoroughly enjoyed meeting writers of other genres. Here’s a pic of one of my new friends: my puppy-in-law, Milo. Zana Bell: I kicked off 2012 with a beautiful ring and an unexpected proposal of marriage from my partner of 25 years! I’m a romance writer, I know my cue. What could I say? I accepted. Later in the year, I was delighted to have my own proposal to Choc Lit accepted! Beverley Eikli: Winning Choc-Lit’s ‘Search for An Australian Star’ competition brought me on board as the newest recruit and was a fabulous way to wrap up the year. I’m looking forward to what lies ahead. Kate Johnson: I could tell you all about my new book and my new niece, both of which were 2012 highlights for me, but I think whenever I see the date 2012 I’m going to think of that extraordinary, unexpected, glorious Olympian summer that seemed to have the whole country, especially sport-hating me, literally jumping for joy. Margaret Kaine:2012 for me will be remembered as the year when despite the recession and floods, our country was uplifted and inspired. Who could forget the Queen’s Jubilee in the rain and the Olympics and Paralympics with their magnificent opening ceremonies. Juliet Archer: Thoughts about 2012: A huge year for Choc Lit, and a big thank you to Lyn and team! On the personal front, mixed emotions at being ‘almost’ empty-nesters – our daughter has gone to live nearer her work in London, and our son spends half his time at college in the US. Evonne Wareham: The highs for me for 2012 have to be holding my debut novel in my hand, then, a couple of months later, winning the Joan Hessayon award, and holding the RNA New Writers’ silver cup in my hand. A memorable year. Sadly, I have to give the cup back next May – but I have my fingers firmly crossed that I might be handing it on to another Choc-lit debut author. Wouldn’t that be nice? Henriette Gyland: 2012 has been a year of contrasts for me. I’ve watched in mounting horror as atrocities have been committed in parts of the world, and seen people’s lives devastated by natural disasters and an economy in tatters – while I myself have been juggling two jobs besides writing. The awful summer didn’t help, and I wrecked my knee climbing a Welsh mountain. (Why did I climb it? Because it was there!). On the other hand, seeing the nation pulling together around a jubilee, the spectacular Olympics and Paralympics, and the prospect of a royal baby has been incredibly life-affirming. Social events have cemented my friendships, my youngest child started high school, and my first novel Up Close was published this December. Liv Thomas – one half of Isabella Connor: 2012 started with the event that would be the most significant in the whole year…it doesn’t seem any time at all since my daughter phoned me in a state of shock to say her pregnancy test had been positive. In the next couple of days, she’d done three more tests and visited the GP, so it was apparent that she was just a tad excited. Being in almost from the very beginning, I thought it would be a long year, but it actually went quite quickly, resulting in the birth of adorable Ben on his due date in October. Any other time, the outstanding highlight would certainly have been the first email from Choc Lit saying they were interested in my co-written novel, and then the meeting with Lyn – frankly, it still seems very unreal. I’m sure CL will understand that it came a very creditable second. I’m sad to see 2012 go because it was a golden year for me. The year started with us moving from a cramped apartment into a house with a garden. Then an English Mastiff puppy, Darius, joined our family. Choc Lit signed up “Beneath an Irish Sky”, and I also took a break from work in the summer and had twelve glorious weeks in which to write. Doesn’t get much sweeter than that. … and for me that means A Bargain Struck. Last week on my personal blog, I showed you the fab cover for A Bargain Struck, to be published by Choc Lit in September 2013. Several of you asked me last week to tell you a little bit about A Bargain Struck, so that’s what I’m going to do today. The title is taken from the following sentence written by John Mack Faragher, in Men and Women on the Overland Trail, and this will give you a clue as to what it’s about. In popular opinion a good marriage was a bargain struck between two strong-willed characters for an equitable and advantageous division of labour. In Wyoming Territory, 1887, Connor Maguire, a widower with an eight year old daughter who is about to start school, needs someone to do the woman’s work on his homestead, and he advertises for a wife. Ellen O’Sullivan, a widow living in Omaha, Nebraska, needs to feel part of a home and a family again, and she answers the advertisement. Naturally, two people thinking of living together as man and wife would be honest and open about themselves in their initial exchange of letters so that there’d be no surprises when they met. Of course, they would. Set beneath the sweeping wide skies of Wyoming, this is the story of a man and a woman who are brought together through need, not love. Libel lawyer, Tom Hadleigh, must urgently visit the 14th century house he recently brought in Umbria, Italy. Alas, Tom has a little problem: he can’t speak a word of Italian; his Italian surveyor can’t speak a word of English, and his regular interpreter isn’t available to accompany him. Enter auburn-haired Evie Shaw, ostensibly an agency temp, in reality the newest reporter on the gossip magazine Pure Dirt. Through the manipulation of her editor, Evie, fluent in Italian, is sent to work for Tom as an interpreter. For Tom, his house will be his sole focus for their week in Italy. Unfortunately for Tom, Evie has a different focus – namely, the exposé she must write about Tom or lose her only offer of a magazine job after months of searching. But the path for the investigative journalist is seldom smooth, and it certainly never is when the subject in hand is as drop-dead gorgeous as Tom. This isn’t the first novel that I’ve set in Umbria, and I’m sure that it won’t be the last. I go regularly to the area and find it quite inspirational. Some names may have changed, but Todi exists. A few years ago, a US magazine voted it to be the most perfectly placed medieval hilltop town in Italy, and it well deserves that accolade. Property that has a view of Todi is more expensive for that reason. In the area around Todi, there are a number of small Roman towns. The fictional Massa Piccola is based on them. Massa means mountain, and piccola means small. 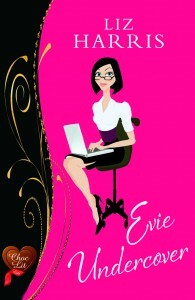 Evie Undercover is a rom com published by Choc Lit. It’s now available on kindle. Click here to be taken to Amazon, if you would like to read the first chapter of Evie’s story. Publication Day – the end of the road. Or is it? The Road Back is officially published today. Today, therefore, is the end of the journey that began eleven months ago when Choc Lit told me that my novel was being accepted for publication. From that moment on, I and my novel have been eagerly waiting to reach our destination – Publication Day. But is this really the end of the journey? No, of course it isn’t. Quite the reverse. It’s the start of a very exciting new journey, a journey that will take the novel out into the world of readers where it’ll be bought ( I hope) and enjoyed (I fervently hope). Today on Publication Day, I shall be making public the fact that I have a novel out in paperback, available for people to buy through Amazon and bookshops. I shall be doing this on twitter, on Facebook, on Radio Marlow at 11am, and on BBC Radio Oxford, at 2pm, when I shall be talking to Jo Thoenes. Today also, I shall be getting things ready to help me say thank you at my book launch next week (Friday, 14th September, Waterstones Oxford, 6.30 to 8pm) to all of the people who have supported me throughout my writing journey. The Road Back and I haven’t got here alone. And tonight, when I raise a glass to Choc Lit, I shall also be raising a glass in gratitude to my family and friends. Cheers, each and every one of you! Having very recently unpacked my suitcase on my return from the States, there is only one W that is on my mind, and that is …… WYOMING. So, welcome to a few glimpses of Wyoming, known as the Equality State because it gave rights to women way ahead of the other states, and ahead of most places in the world (1st woman governor, 1st women jurors, 1st State Senator, and so on). Wyoming is the second least densely populated state in the USA (Alaska is the least densely populated), and it is, of course, at the heart of The Wild West. It was a fantastic research trip/holiday. I shall always remember the dramatic scenery I saw, the delightful people I met and the great excitement of discovering the elusive answers to questions that had been plaguing me about the life of homesteaders in Wyoming, 1887. I took my camera with me (naturally), and although I recognise that I’m not a good photographer and that this was not a photographic outing, I thought I would share some moments of the trip with you. There were some lovely buildings. There were some not so lovely buildings. Fair enough. The outhouse, which dates from the late 1880s. It would be used, then eventually filled in and moved to another location. I’d always wondered how they dealt with such matters. Driving from Baggs towards the small town of Savery, population 27, set in a lovely area that led up to the Sierra Madre. The State abounds with rivers edged with shining white pebbles of various sizes, a scene that I find really attractive. We saw row after row of glorious aspen trees as we left Savery and went towards the Sierra Madre. Yellowstone, most of which is in Wyoming, deserves a special space to itself. It isn’t an area to walk through unescorted, though, because of the prevalence of brears – grizzly, brown and black. There are Be Bear Aware signs everywhere. The Grand Teton Mountains almost obscured by haze. among the scenic views, there were different varieties of geysers. And there is some not obviously beautiful scenery. Below is a typical vista of Wyoming. I find the aridity very attractive, but I recognise that it’s not to everyone’s taste. The wide open spaces of Wyoming, and its big skies, were too much for my camera to capture. All over the State, there were references to its Wild West heritage – in every street of every town, and in the markers and tracks across the State. 100 miles south of the railroad town, Rawlins, is Baggs, formerly a stage coach stop. My heroine did the Rawlins-Baggs trip by stagecoach; we did it by car. Not surprisingly, there were plenty of opportunities for exercise, most of which involved horses. Getting on to the horse was the best thing of all, though. We stayed on a working ranch at the foot of The Rockiesand had unlimited riding. It was an amazing way to research a novel, and I feel very lucky to have been able to go and see where the characters in my novel lived their lives. If anyone else is thinking of going to Wyoming, I’d say Go For It! You won’t rgret it. This has been a weekend and a half. On Saturday evening, the choir with which my husband sings, the Benson Choral Society, put on one of its three annual concerts in Dorchester Abbey and, as always, the family came out in force to support him. On Saturday evening, eight of us sat down to the main course, then dashed off to the Abbey for the (brilliant) concert, returning later for pudding, cheese and coffee. We all had breakfast the next morning, then two of the number left. Six of us sat down for Sunday lunch (the venison casserole I mentioned on twitter) and black cherries jubilee. At five o’clock, all of the guests left for London. At five thirty, my husband’s two friends from Cheshire arrived. We sat down to dinner at seven thirty (venison casserole again – on Saturday, I’d made enough for an army). At nine thirty, the friends left for Stansted, taking with them my husband. They’ve gone to Italy. I staggered downstairs this morning to be greeted by a GINORMOUS pile of washing – bed linen for all the beds in the house, towels, napkins, shirts, you name it. Dealing with it will take a couple of days, if not more. It was a depressing sight as I have so much I want to do, and funnily enough, washing and ironing don’t figure on my wish-to-do list. Then I opened my mail and my email. Katie Fforde had sent me the page with the Bookseller review of The Road Back; my copy of Romance Matters fell open at the page taken out by Choc Lit, congratulating Jane Lovering and Evonne Wareham for winning the Romantic Novel of the Year Award 2012 and The Joan Hessayon Prize, respectively; my copy of The Silent Touch of Shadows, by Christina Courtenay, is at hand as I’m starting to read it today; my email brought details of The Festival of Romance 2012, which takes place in Bedford in November, and in which I and other Choc Lit authors are participating; the programme for the RNA Conference 2012 in Penrith is on my desk nearby. Mine is a world full of novels, both reading and writing them, and it’s a BRILLIANT world in which to live. As I sort out the piles of washing, I shall be counting myself lucky that I don’t live in Wyoming, 1887, and as I get down to the ironing, I shall be thinking about Ben Davies (I loved Please Don’t Stop the Music, Jane) and I’ll be wondering what I shall think of the hero I’m about to meet in the pages of The Silent Touch of Shadows. You don’t need to win the lottery to be lifted out of the mundane into the sublime – all you need to do is to open the page of a good book. Or to find yourself in front of a computer, with the time to write one. That’s my thought for the day. Plus the fact that I NEVER want to eat venison again! Homeland: a good ending or bad? A couple of weeks ago on my blog, I mentioned a play in which the ending had been disappointing, and I then went on to talk about a book where the ending had left me less than satisfied. Today I thought I’d put the spotlight on a TV programme – Homeland, which finished last Sunday. On Monday morning, the twitterverse was alive with opinions about how satisfactory/unsatisfactory the ending had been. The impression I got was that the majority felt that the ending worked, although a vocal minority felt let down by its inconclusive nature. The problem for the producers was that they had to leave a sufficient number of unanswered questions for there to be a sequel, and ideally a sequel with the same central characters. The potential profit from a second series was too great for them to let it all end in a single series, even though the Israeli series from which Homeland was taken was completed in one series. I thought that the TV company got away with it. More than that, I thought they got away with it in style. Amazingly, I found myself willing Brodie to go through with the mission to blow up the Vice President and the top people in the US government, who’d been so cleverly forced into a single room, but at the same time hoping that he wouldn’t blow them up as that would mean that he died, too, and I liked him. It was a tribute to the quality of the acting and writing that I felt the two conflicting emotions at the same time. A happy compromise was found – Brodie detonated the explosive vest, but the detonator didn’t go off. The daughter phoned and the moment passed. A second series could go ahead. And what a basis from which to start the second series! Two central characters who engage our emotions, but in whom we can’t trust. Has Brodie been turned back into a goodie who’s going to double-cross Abu Nazir? Can we trust Carrie, in the grip of her bi-polar disorder, to see things as they really are? And what about the missing video that Brodie had made to be played after his death? Did he get it back from Walker after he’d killed him, or didn’t he? Did Walker take it, at all, or did someone else take it? Gripping stuff. The end of the first series left us hanging and raised as many questions as it answered. I went along with that. Others didn’t, I know. What about you? What did you think of the ending of Homeland?